Videos : Awful video catches coach berating a young child during hockey game. Awful video catches coach berating a young child during hockey game. If you've grown up around the sport of hockey you've probably had the misfortune of encountering at least one parent who behaves in this manner, but that does not make it any less cringe worthy when you see it happen. A video published on social media by a Facebook user named Stella Peastitute roughly 12 hours ago has already been viewed over 50,000 times already and you can easily see why it is starting to go viral on social media. 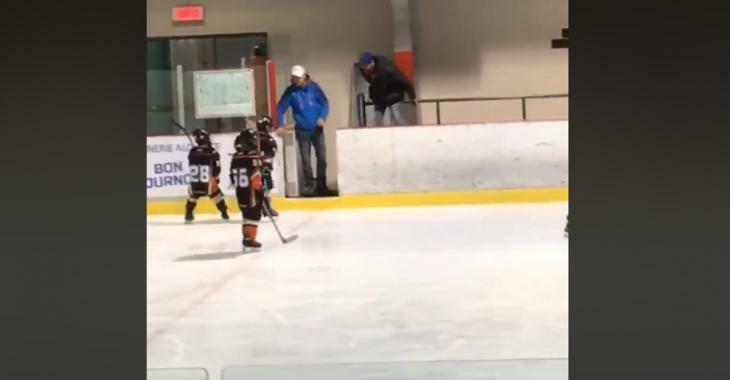 In Stella's video a man can be seen standing behind the bench of a kid's hockey game, presumably one of the coaches, and his behavior is nothing short of horrifying. The man can be seen verbally berating one of the children, and make no mistake these are indeed children, during a long tirade as the young man slowly and sheepishly skates back to the bench towards the coach that is unloading on him. Perhaps the worst part of this video however is that the coach continues to unload on the young man even after he has gotten on the bench, and who knows how long this went on for before the camera started to roll. I have no doubt that Stella pulled out her recording device, likely her mobile phone, specifically due to the fact that this coach was going off on this young child. That makes me believe that either this has happened before, or this tirade from the coach had been going on for some time before this video even began to capture what was going on. If you're a hockey parent and you're reading this, do not be this guy. Update: The coach who was featured in the video has now issued a public apology.